Heels spurs are most commonly caused by a condition known as plantar fasciitis. When a patient suffers from this condition, it can be extremely painful to do normal, daily activities, such as walking and standing. Plantar fasciitis occurs because of a tight fascial band. The fascial band attaches at the heel bone and spreads throughout the bottom of the foot. Typically, in patients with low arches or extremely high arches, the band is overworked and pulling at the insertion site (at the heel bone). 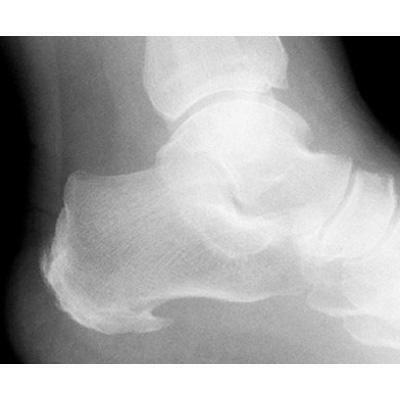 With constant pulling of the fascial band, the heel bone can develop a calcification known as a heel spur. This spur, once formed, permanently remains there. The question is whether to remove the spur or not. Usually, when patients actively treat their plantar fasciitis, the symptoms of heel pain resolve. The heel spur is typically never the cause of the pain. It is the inflammation and soft tissue swelling surrounding the heel with constant pulling and tightness of the plantar fascial band that causes the pain. Once the plantar fascial band has been loosened (via stretching) and the inflammation has subsided, the symptoms resolve. In some cases, even after aggressive treatment of plantar fasciitis, the patient remains in pain. One reason could be that the fascial band is unable to be loosened via stretching and in these cases it can be surgically released. Another reason pain could remain is that the heel spur can form in such a way that it microscopically tears the plantar fascial band. Ultrasounds or MRIscan be performed to diagnose this cause. If it is found that the heel spur is causing harm, it can be removed surgically. Surgical removal of the heel spur involves an incision into the foot, spreading and freeing of soft tissue, and then filing down the bone spur. This can be done in a surgery center or in some cases, in the office. The recovery time is typically a total of two to four weeks. A special shoe is worn until the skin heals and stitches are removed within 10-14 days after the procedure. Physical therapy is often started to help prevent a heel spur from forming again.